PERFORMANCE DATES: Feb 24 - Mar 18, 2012, to include one Thursday performance on March 14th. Please bring all conflicts as the rehearsal schedule will be developed around them if you are cast. Ages are not the actresses’ physical age—only your ability to portray that age range. SYNOPSIS: Summoned to a convent, Dr. Martha Livingstone, a court-appointed psychiatrist, is charged with assessing the sanity of a young novitiate accused of murdering her newborn. Miriam Ruth, the Mother Superior, determinedly keeps young Agnes from the doctor, arousing Livingstone's suspicions further. Who killed the infant and who fathered the tiny victim? Livingstone's questions force all three women to re-examine the meaning of faith and the power of love, leading to a dramatic, compelling climax. 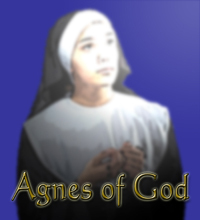 Agnes - Sheltered, innocent. Script describes her as being 21. Ability to sing will be a plus but not required. If you can sing, you may be asked to demonstrate your a cappella vocal abilities. Doctor Livingstone - Educated woman around 40-50 (script describes her as being menopausal). Very strong willed, chain smoker (herbal cigarettes will be used). Mother Superior - Older Woman 50-60. Very set in her ways. Very motherly to Agnes and protective of her in Dr. Livingstone’s presence. Script describes her as married with two adult children prior to becoming a nun. Limited smoking is required. If you have any questions, e-mail walkgroup@zoominternet.net.